This system includes all Dual Frequency IR Receiver to support many of the new HDTV product designs! Our In-Wall IR Receiver Target Repeater for IR Distribution allows you to handle today's projects but add up to 40 In Wall IR receivers around your home or business. Run a piece of Cat5 cable from the In Wall IR Receiver to the IR control Block (2 twisted pairs required, shielded or unshielded). Plug the power adapter into a mains power outlet and into the IR control unit. That's it.. Your done.. Now just aim the IR remote at any of the In wall IR receivers and your Audio Video devices will be controlled. 2 x Dual Head IR emitters. CFL Friendly, allows installations in areas with compact fluorescent lighting, and works in most lighting environments. Wide band IR receives IR from most types of remotes, This is the advance receiver working at 34Khz - 60Khz. Professional Look and feel- You don't need to leave cabinet doors open when you're enjoying your home theater. By using our in wall infrared signal distribution system in your entertainment center, you'll be able to control up to 6 A/V devices secured in closed cabinets or closets using your existing IR remote control. Your friends will think you had a pro install it! Working with Plasma and LCD Displays Designed to reject interference from plasma or LCD TV's, the pollution on these flat panels can be a challenge. You can work around this by installing the In Wall IR receiver in an area that isn't exposed directly to the TV screen - at the back of a bookshelf, on the wall below or next to the TV - somewhere the eye can't "see" the TV image. Just make sure you still have a direct line of sight from the eye to your normal seating position. The Hidden IR System can be used in a room with a plasma TV or LCD display by installing the IR receiver in an area where it can't "see" the TV image - behind the TV or in a bookcase, for example. Two (2) dual IR emitters are included to control four (4) A/V components. Add up to 1 additional dual IR emitters to control a maximum of 6 A/V devices with this IR distribution system. 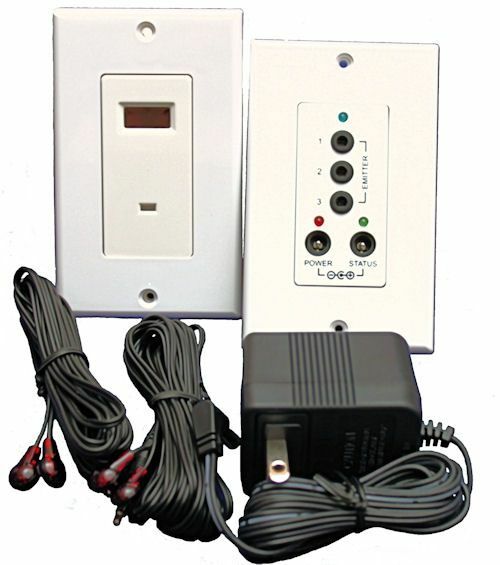 Add up to 40 In Wall IR receivers so you can have total home or building control. A. We have seen that some cable boxes like the SA HDTV DVR's and Direct TV HDTV Receivers use a higher frequency than what has normally been found in USA homes. We have seen that some cable boxes like the SA HDTV DVR's and DirectTV H21 use a higher frequency than what has normally been found in USA homes. Because of this we have already updated these to Dual Frequency IR Receiver.